2) the tenth of the Sixteen Arhats. When he was six years old the Buddha visited his homeland and was greeted by his family. Soon afterwards Rahula, wishing to be with his father, joined the Sangha. He was noted for his diligent study and observance of the Vinaya. When the Buddha was about to enter parinirvana, Rahula, overcome with grief, begged him to remain, but the Buddha reminded him of the impermanence of all things and assured him he would be guided by all the buddhas for as long as he remained in the world. He lives in northern India in Priyangudvipa with 1,000 arhats. He holds a diadem which he received from the gods of the Heaven of the Thirty-Three, which carries the blessing to vanquish passion and understand the teachings. Those who pray to him are cared for by the protective deities. 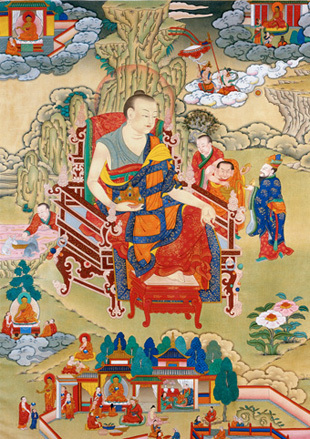 3) The dharmapala Za Rahula. 4) One of the eighty-four mahasiddhas. 5) A class of worldly spirits. This page was last edited on 1 February 2011, at 10:43.